I am sure it can’t have escaped your notice that the much-heralded Oxford Dictionaries’ word of the year wasn’t actually a word at all; rather, it was an image representing the word that comes from the Japanese for picture character. That would be e(picture)+ moji (character). 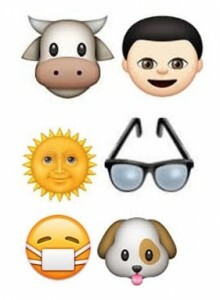 The emoji character ‘Face with Tears of Joy’ was the winning image as it is thought to be most the used image of the 845 images that currently make up the full list of characters. Speaking of the full list, how many can you identify? They cover a whole range from food to flags, animals to human body language. If you never have used them, take a look at your smart phone, tablet or computer. There is probably a keyboard of images there or waiting to be added. Though they have been around since the late nineteen nineties, it was last year that really saw their explosion in their use. While detractors might sigh and see emoji as another way that language is being eroded, the vast array of images can be put to a creative use in the ELT classroom. So let’s look at a few ways you can utilize them with your students. Starting with vocabulary. Just as I asked you how many you could identify, so too you can ask your students. Rather than simply listing them all, you can use emoji to augment vocabulary lessons. For example most flags of the world are included so you can tap into those for introducing and revising countries of the world. If, like many teachers, you use social messaging apps such as ‘what’s app’ with your students, you can quiz them by sending a flag and getting the students to tell you what country it is. Alternatively, for a class warmer, students can use the images for vocabulary races for example, the first person / team to write out ten words shown in emojis. Staying with vocabulary, they can be used to teach and revise compound nouns, expressions and idioms. Can you work out what the following are? In class (or via your social media group) choose a sequence of five emoji and get the students to create sentences and small stories. The students can even challenge each other. Another way to use emoji is to help guide writing via a rebus. Rebus writing is where a word is represented by an image. They have existed since the first cave paintings. 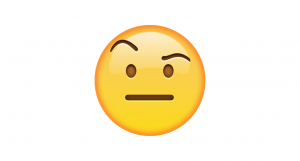 I first came across the idea of using emoji like this on the Davy Hulme school blog. Here the teacher asked the students to replace words in fairytales with emojis. As you can see from the examples on http://davyhulme.primaryblogger.co.uk/literacy/using-the-emoji-keyboard-to-make-a-fairy-tale-rebus/,this proves to be an excellent creative thinking and writing exercise, which can be easily be transferred to the ELT classroom. A useful site to help you create texts is http://meowni.ca/emoji-translate/. Moving from writing to speaking, get the students to create a message of emojis to illustrate a period of activity, i.e. what they did the previous evening or at a weekend. Once they have finished they either send or show their classmates their message. This can be a pairwork or group activity. The students then have to work out what their colleague did by interpreting the emoji and asking the writer questions. Finally, emoji can be the catalyst for speaking exercises. The list of emoji characters is always being added to, with a list of contenders regularly being put forward by the Unicode Consortium (the body that oversees emoji). In fact the list for 2017 is already being put together and includes one I think would become my most used – the skeptical face. Through use, emojis have gained various meanings; however, as with any piece of language, meaning is only attained if all users in a group understand it. 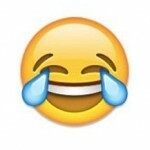 Take for example the text phrase LOL, which most understand as ‘laugh out loud’ but some take to mean ‘lots of love’. Or for example when I first saw ‘Face with Tears of Joy’, I thought it was someone crying rather than laughing. This concept can be used for another speaking task, the class deciding their own meanings for a set of emoji. By the way, the answers to compound nouns are cowboy, sunglasses and sick as a dog.